A versatile seasoning made with real beef to boost the meatiness and aroma in many dish applications. For Broth: Dissolve 20g (2 tablespoons) of Knorr Beef Seasoning Powder in 1L of boiling water. 1 pack makes up to 50L of broth. 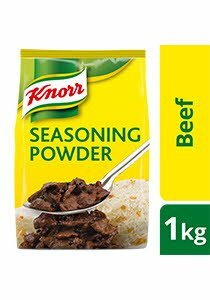 For Stir-Frying, Marinating and Seasoning: Use 15g of Knorr Beef Seasoning Powder for 1kg dish preparation for improved flavour and taste. Made with good quality beef fat and blend of spices.